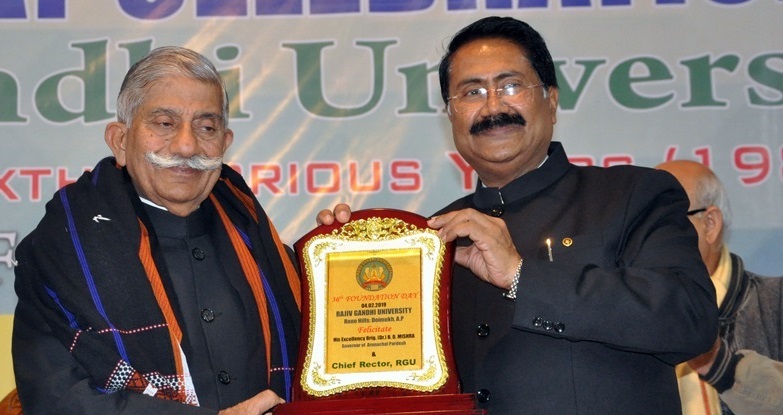 Arunachal Pradesh Governor Brig (Retd) Dr B D Mishra on Monday called upon all the stakeholders of Rajiv Gandhi University (RGU) to make concerted efforts so as to make the university one of the best in the country. The Governor who was addressing the 36th Foundation Day celebrations of RGU said that for a university to progress and success, there must be study atmosphere and academic environment. Mishra emphasized on transparency, accountability, honesty and correct utilization of fund in the infrastructure development of the university. Talking about the academic activities, the Governor said that while organizing seminars, conclaves, workshops, symposiums and academic meets, the organizing committee must take care and not be extravagant. The Governor also advised the students for cent percent attendance, research and innovative activities and paper writing and presentations. Stressing that they must take part in sports and co-curriculum activities, he said that the student life is the only opportunity for such healthy activities. Mishra also advised the students to be entrepreneurs and job providers by availing start-ups programmes. The Governor further informed that the Placement Review Committee for ensuring high campus placement of the students, comprising the Professors of Rajiv Gandhi University, North Eastern Regional Institute of Science and Technology, National Institute of Technology and government senior officials been set up by him has finalized its report and it would soon be presented to the chief minister and his council of ministers to streamline and finalize it. As a gift to the university on the occasion of 36th Foundation Day, the Governor assured of commissioning a National Cadet Corps Unit in the university. University vice chancellor, Professor Saket Kushwaha briefed on the challenges and achievements of the RGU in the last 35 years. Among others, First Lady Neelam Misra, Founder of Sulabh International Social Service Organization, New Delhi, Dr Bindeshwar Pathak, former vice chancellor Professor Tamo Mibang and Gaon Burahs of Doimukh and its nearby villages were present on the occasion.